The statistics are alarming: one-third of American children are obese or overweight while only a small percentage are meeting recommended dietary guidelines. Reliv Now for Kids can help your family bridge the nutritional gap. Essential vitamins, minerals and micronutrients give growing bodies what they need to thrive. Key nutrients are essential to the development of a child’s brain, eyes and nervous system. Unfortunately, the modern child’s diet includes many over-processed foods. Today’s kids rarely get the complete array of vitamins, minerals, protein and micronutrients necessary to reach their full potential. 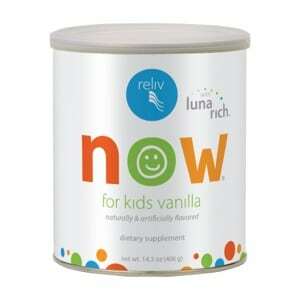 That’s why Reliv Now for Kids with LunaRich covers more than just the basics. Compare Reliv Now for Kids to the most popular children’s multivitamin pills. Notice anything different? Reliv Now for Kids is a powdered supplement that delivers nutrients in a liquid shake rather than a pill, enabling quicker, more complete absorption. Next, look at the label. Cutting-edge nutrients make Reliv Now for Kids the superior children’s supplement. A special proprietary blend of advanced ingredients is designed to boost kids’ energy, growth, and mental performance. Reliv’s exclusive LunaRich® soy powder You’ve found a nutritional breakthrough — scientifically designed to maximize soy’s documented health benefits. Broad base of basic nutrients and advanced nutrients It helps meet kids’ nutritional needs for growing bodies and developing minds and boosts energy and mental performance. DHA, an omega-3 fatty acid It provides a nutrient critical for development and function of the brain, eyes, and central nervous system. Phosphatidylserine and Phosphatidylcholine (PS & PC) It supports healthy cellular development, mental clarity, memory, learning and cognitive function. Grape seed extract, a powerful antioxidant It protects against cell-destroying free radicals. Delicious vanilla or chocolate flavor Kids will love the creamy, healthy shakes filled with advanced nutrition to fuel their day. How much should I take daily? Suggest one scoop daily in the beverage of your choice. If dealing with a health issue you can take 2 – 3 scoops per day.